Let your lips be as tender as your heart! Soft smooth lips make your smile even more beautiful. Give your lips the nurturing of a fabulous lip balm that repairs and soothes even most damaged lips. 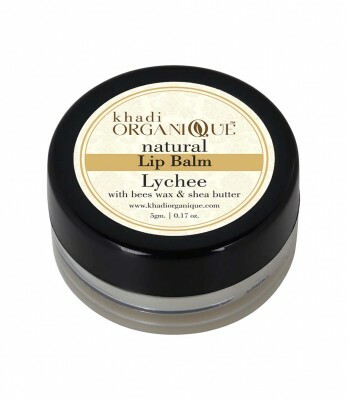 With a great healing effect, this excellent Lip Balm from Khadi Organique is enriched with the goodness of Lychee. A rich source of anti-oxidants, Lychee, along with other essential oils and butters, hydrates the lips making them supple. The delicious fragrance invites and lingers throughout the day. Give your lips the boost of Lychee Lip Balm for protection and flake free lips.
" Lychee fruit Extract, Apricot Oil, Avocado Oil, Vegetable Oil, Jojoba Oil, Almond Oil, Carrot Seed Oil, Vitamin E, Wheat germ Oil, Beeswax, Cocoa Butter, Kokum Butter, Shea Butter, Honey, Glycerin, Fragrance, Color "